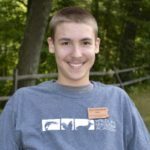 This week’s post comes to us from Peter, a monthly blog correspondent, as well as a Drummers and Ursids alumni. He writes about identifying trees in the winter, when there are no leaves to rely on. This is not only a useful skill to have, it is also a fun way to spend time outdoors or on hikes! Tree identification can be difficult when the snow flies and the leaves are gone. One of the easiest ways to identify a tree in the spring, summer, or early fall is to identify its leaves. But in the wintertime, there are no leaves to look at. 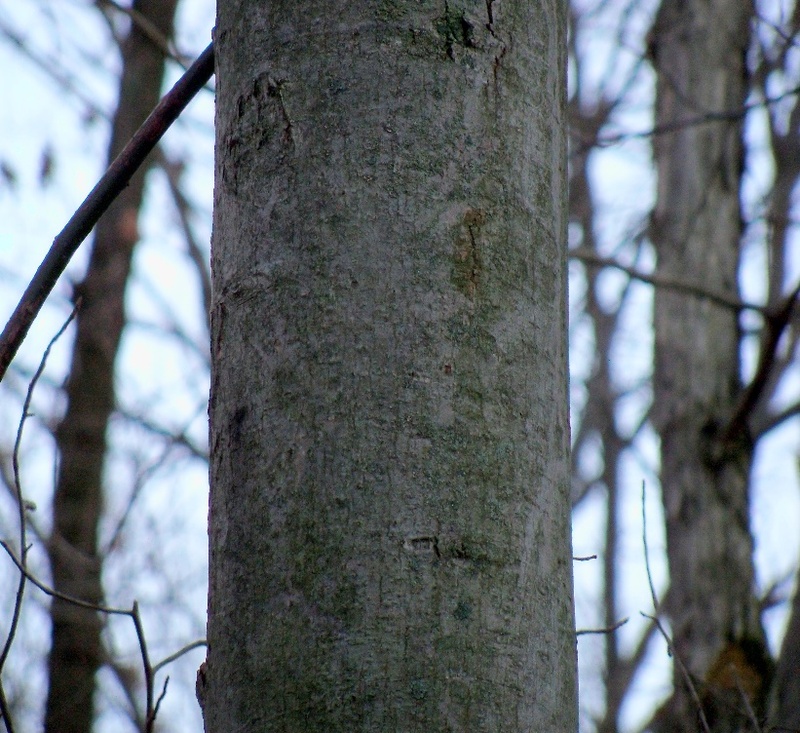 Trees have to be identified by their bark, branching pattern, or buds. Although sometimes difficult, wintertime tree I.D. makes winter hikes more fun, interesting, and educational. Winter tree I.D. 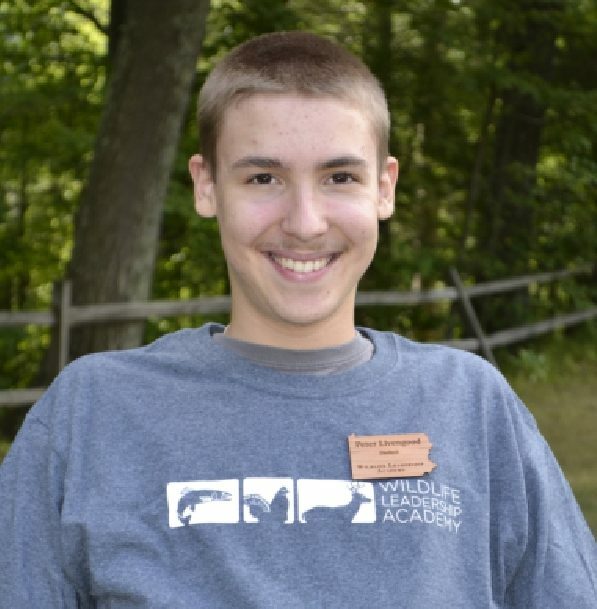 also enables you to evaluate habitat for wild animals during the winter. Here are some helpful tips, ideas, and photos for winter tree I.D. When identifying trees by their bark alone, it is very important to take note of the size of the tree. 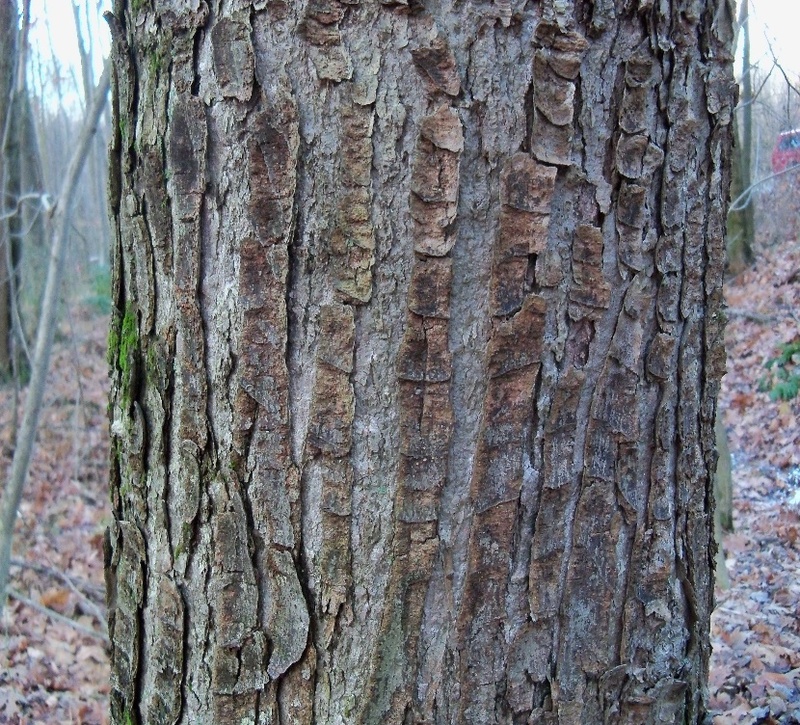 Young trees often have significantly different bark than older trees. 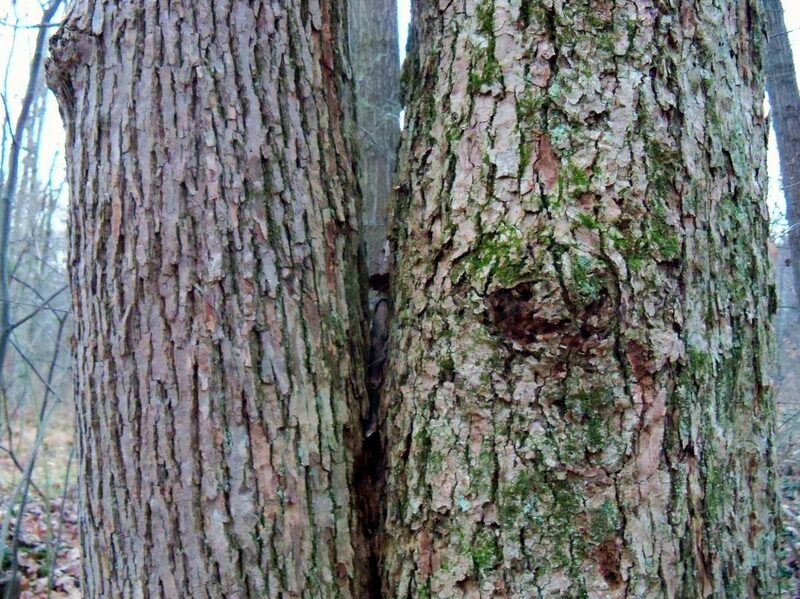 Here is a photo example of the bark of two red maple trees, one young and one old. As you can see, the young red maple on the left has smooth bark, but the older red maple on the right has rough bark and looks like a different tree! Also, some species have great amounts of variation in the bark pattern and color from tree to tree. This can be a huge pitfall if you only have the bark to identify a tree. Here is a picture of two cucumber magnolias growing together. They do not even look like the same species! However, I verified that both of them are cucumber magnolias by examining their leaves. The lichens growing on the tree on the right side of the picture make accurate I.D. even more difficult. 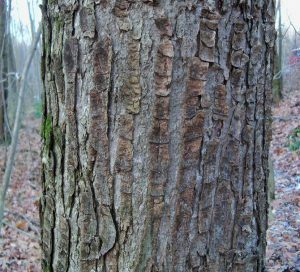 Some other species that have significant bark variation include the red oak family and maple tree family. An easy way to identify trees with tricky bark is to utilize other factors, such as the branching pattern, buds, or growing location. Here are some tips for this kind of I.D. Look at the buds if possible. Buds are mostly unique to their species, and field guides often mention how to identify them. Buds can be useful in differentiating between trees of the same family that look very similar otherwise. Pay close attention to the branching pattern. Here are some species that have readily identifiable branching patterns. For American Beech, look for the branches to droop or grow at a slightly downward angle. For Black Gum, the branches grow in a circular pattern. Black Gum trees do not get the large spreading boughs like an oak tree, but have smaller branches at more frequent intervals. Cucumber Magnolia trees have a similar branching look, but grow much taller than Black Gum. 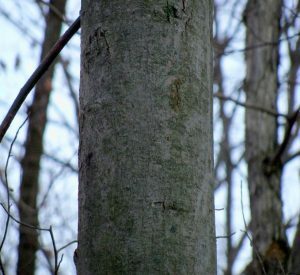 Each tree species has a unique branching pattern, and once learned, the branching patterns make for more consistent identification. Keep an eye out for where the tree is growing. Most tree species have a particular type of soil and growing location that they like. Some trees, like alder, only like to grow in wet soil, whereas maple grow in many types of soil. Other trees, such as Black Locust, are very shade intolerant. Tree identification guides usually tell what type of soil composition and the amount of sunlight individual species prefer. Look out for trees that have odd identifying features. Break a twig on sassafras, black birch, or black cherry and smell their unique, identifying scent. Look for thorns on trees like hawthorn, black locust, or devil’s walking stick. Tree identification in the wintertime can be challenging to begin with, but it gets easier with practice. Like most things, the more you do it, the easier it becomes. Identifying trees is a rewarding pastime, and it means more to be in the woods when you can identify the trees around you. I would like you to go out into the woods, take a tree identification guide with you, and practice your wintertime tree I.D.